Wild Thimbleberry Jam from Northern Michigan for sale. Buy online at Zingerman's Mail Order. Gourmet Gifts. Food Gifts. Exceedingly rare. A treat for jam lovers. Really rare, really expensive and really good. 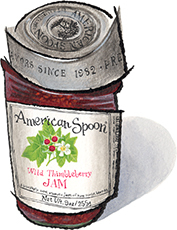 We were able to finagle a few cases of this almost unknown jam from American Spoon in Petoskey, Michigan. Supplies are very limited, and they’re only available for a short period of time every year. This is by far the most precious and costly fruit in America, and demand always greatly exceeds supply. Thimbleberry bushes grow in the cool, moist, rocky soils of Michigan's western Upper Peninsula. The scarlet fruits are tart with a captivating floral aroma. The seeds are small, crispy and release a pleasantly nutty flavor. To make the berries into jam American Spoon simmers them for just a few minutes with Michigan beet sugar so their delicate aroma is not cooked off. Rarely seen outside Michigan, the jam is sweet, tart, bright and floral. A special jam for special occasions, like weekend morning toast when you've got tickets to Keith Richards. From what I know, thimbleberries grow—or at least did grow—in a band all across North America, from Alaska, Montana, Minnesota, Michigan and Ontario to the East Coast. Supposedly they’re named after the Thimble Islands in Connecticut, although I guess they’re rarely seen in that region these days. Of course, they might get their name from the fact that they look like the sewing type of thimbles, especially since the delicate fruit can even fit on your finger like a thimble. The bushes can grow to be up to eight feet tall and have big leaves that look a bit like maple tree leaves. Unlike a lot of its relatives the plant has no thorns: instead, it’s got a five-petaled white flower. Like raspberries, thimbleberries aren’t a true fruit but rather a collection of red “drupelets” (there’s your Scrabble word for the week) that, together, look like a thimble. Thimbleberries aren’t easy to collect. The average picker gets a pound and a half in an hour. This is not a way anyone is going to get rich. Thimbleberry picking is probably more like going fishing on the weekend—a tradition with high emotional value. Fortunately for the rest of us, a few folks still do it, which means that we get to eat these really great preserves.